Chargepoint operator InstaVolt announced last May that it would start rolling out the initial 200 units as a result of a ‘multi million-pound’ deal with American manufacturer ChargePoint. InstaVolt is now acquiring a further 400 rapid chargers from ChargePoint, which will also be installed along popular routes. 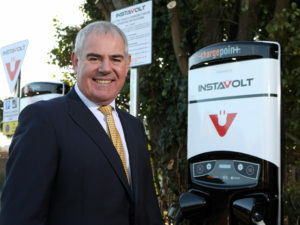 Tim Payne, CEO for InstaVolt, attributed the accelerated roll-out of the network to increased public awareness and growth in sales of electric vehicles. 2017 registration figures from the Society of Motor Manufacturers and Traders (SMMT) show the alternatively fuelled vehicle market grew 34.8%, accounting for one in every 20 vehicles registered. Plug-ins (including hydrogen fuel cell models) accounted for 47,263 units (+27.4% on 2016) with almost three quarters taken by plug-in hybrids.